Live an experience like no other! Book an appointment to visit our homes. 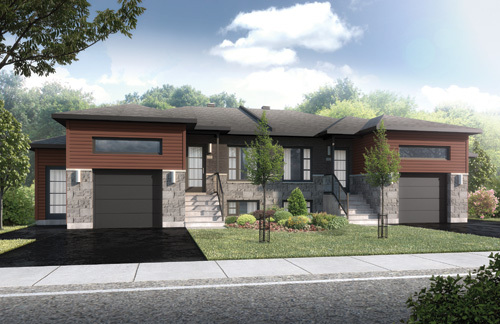 The Chrome 1.5 semi-detached, duplex model is a variation of the popular bungalow style townhouse model. This modern style townhouse is the ideal new home for home buyers looking for the perfect investment property. Featuring spacious 2 bedroom units both upstairs and downstairs, this model offers the versatility to collect additional rental income from the lower unit, while living upstairs, to offset a large portion of the monthly mortgage payments. Both units are spacious and incorporate natural light in all common areas and bedrooms. Whether it is rented to a tenant, used as parental in-law suite or used by another member of the family, the units are totally independent from each other by having their own separate civic addresses, entrances, parking, utilities and living spaces. Our semi-detached models have been designed for comfort and peace of mind. Second to none, we employ the most advanced methods of soundproofing between homes. Living in a Chrome series semi-detached model will provide you with quiet enjoyment and peace of mind that you would expect from a well-designed townhouse model. Do not hesitate to contact me by email or phone if you have any questions about this unit. It will be my pleasure to provide you with all the necessary information you require. If you decide to come see us at the Sales Office, please contact us.